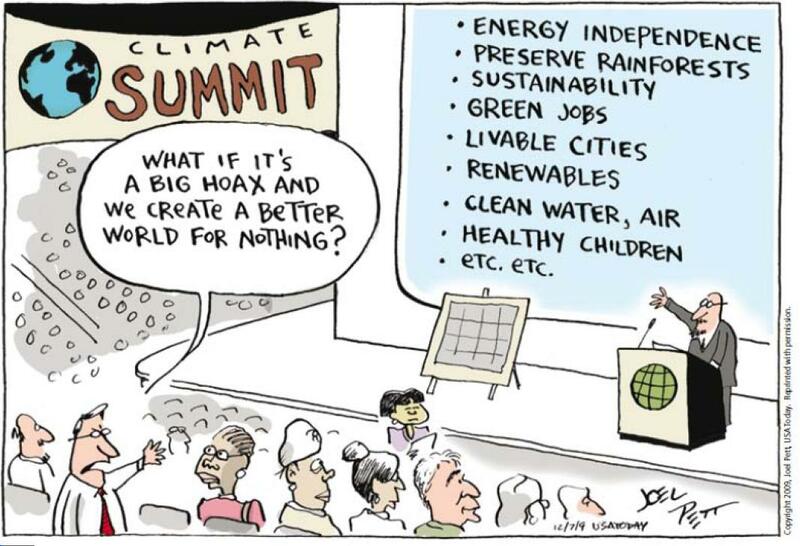 According to this popular cartoon, getting rid of fossil fuels is a free lunch. percent more natural gas than it did in 1980. Haven’t alternative fuels played a big role, too? No. because fossil fuel energy is reliable whereas solar and wind aren’t. energy, such as coal, gas, nuclear, or hydro. forms of energy, and turn them into cheap, plentiful, reliable energy. What’s so deficient about solar and wind? Such resource requirements are a big cost problem, to be sure, and would be one even if the sun shone all the time and the wind blew all the time. But it’s an even bigger problem that the sun and wind don’t work that way. That’s the real problem– the intermittency problem, or more colloquially, the unreliability problem. As we saw in the Gambian hospital, it is of life and death importance that energy be reliable. There are some situations where it isn’t, to be sure, and solar has a place there– such as solar hot water heaters or swimming pool heating systems. But for just about everything we do, reliable, on-demand energy is vital–and without it, our electricity grid blacks out. In a given week in Germany, the world leader in solar and number three in wind, their solar panels and windmills may generate less than 5 percent of needed electricity. What happens then? Reliable sources of energy, in Germany’s case coal, have to produce more electricity. For various technical reasons, this is even more inefficient than it sounds. For example, because the reliable sources have to move up and down quickly to adjust to the whims of the sunlight and wind, they become inefficient– just like your car in stop-and-go-traffic– which means more energy use and incidentally more emissions (including CO2). And what about when there’s a particularly large amount of sunlight or wind? For an electric grid, too much electricity will cause a blackout just as too little will– so then Germany has to shut down its coal plants and be ready to start them up again (more stop and go). In practice they often have so much excess that they have to pay other countries to take their electricity– which requires the other countries to inefficiently decelerate their reliable power plants to accommodate the influx. This is obviously not scalable; if everyone’s electrical generation was as unreliable as Germany’s, there would be no one to absorb their peaks. The only way for solar and wind to be truly useful, reliable sources of energy would be to combine them with some form of extremely inexpensive mass-storage system. No such mass-storage system exists, because storing energy in a compact space itself takes a lot of resources. Which is why, in the entire world, there is not one real or proposed independent, freestanding solar or wind power plant. All of them require backup –except that “backup” implies that solar and wind work most of the time. It’s more accurate to say that solar and wind are parasites that require a host. [A] proper reaction to a major danger from fossil fuels would be sorrow. Think about it: If the energy that runs our civilization has a tragic flaw, that is a terribly sad thing. It would be even worse, say, than if wireless technology caused brain cancer. The appropriate attitude would be gratitude toward the fossil fuel companies for what they had done for us, combined with recognition that we would have to suffer a lot in the years ahead, combined with the commitment to the best technologies that I mentioned earlier [hydro and nuclear]. If anyone can turn this passage into a great cartoon, I’ll be delighted to post it. The largest preventable cause of global warming that could have been (and was) removed with the smallest marginal cost was the inefficiency of the Communist system of fossil fuel use. The only way for solar and wind to be truly useful, reliable sources of energy would be to combine them with some form of extremely inexpensive mass-storage system. No such mass-storage system exists, because storing energy in a compact space itself takes a lot of resources. This really is the key challenge. In the novel Friday, Robert Heinlein describes a world where the company which solved energy storage problem (by the device called Shipstone) is the most valuable company in the world. Indeed no Shipstone exists yet (although pumped storage hydroelectricity, when possible, works today and is a tried and true technology), but it is very unclear whether no Shipstone can possibly exist. Rather than giving up, I think energy storage problem is the problem people who advocate renewable energy should attack. There is one. One lake of water sits about 1500 feet above the other. When there is surplus electricity, water is pumped from the lower lake to the upper. When power is needed, water flows from the upper to the lower, spinning a generator. It’s in use at Castaic lake in southern California. In spite of that, solar and wind are still ridiculously uneconomical. Yes, the campaign is associated with Alex Epstein’s Center for Industrial Progress. Why do advocates of fossil fuel burning argue that the best way to create jobs is by eliminating all the jobs making sure that burning fossil fuels is safe and does not create huge liabilities in future pollution and other harms? Isn’t burning fossils the best way to create jobs, jobs restoring mountains and valleys damaged by mountain top removal, valley fill while leaves waste land with out the virtuous job creation of restoring the landscape back to its original state with mine tailing sequestered under ground and covered with top soil that supports the forest and meadows the supported the Appalachian economy with hunting and fishing and other outdoors activities, forestry produces from diverse woodlands. Sure coal would cost a lot more, but that is because of all the jobs coal mining is creating. And burning coal would be done in the most modern power systems which capture all the pollutants in high cost capital equipment, high cost because the high tech requires tens of millions of man-hours of labor to design and manufacture. And the captured waste would then be converted into construction materials which will bind the heavy metal in ceramic brick which will never harm any life by polluting the water. Sure, integrating that manufacturing of brick products with coal power generation will requires thousands of workers, but the point of burning coal is to create jobs. Sure clean coal power create jobs will be more expensive, but unless you believe killing jobs and killing people is a virtue, paying higher prices for coal electricity to create hundreds of thousands of good middle class jobs is really desirable. The problem with the coal industry over the past three decades is it has been actively killing jobs and killing people to cut the cost of coal power in order to generate profits, not return on investment because investment has been minimized to kill jobs, but to create profits, the profits of economic inefficiency. Not killing workers in mines is opposed because all the labor required to ventilate the mines of coal gas and the labor required to stone dust on all exposed coal cuts into profits, or worse results in price hikes for coal that cuts demand as natural gas becomes a cheaper substitute. Not polluting the water that people drink is opposed because that requires too many workers be employed building capital like storage tanks that won’t leak, or maintaining ash waste ponds for centuries to ensure they don’t break lose and flood the rivers power plants must have to operate and thus pollute the water people use downstream. So, to say burning fossil fuels is good for the economy is true is you are going to employ all the required workers to do everything safely in the present and in the future, but high labor costs means burning fossil fuels is not cheap. Therefore, burning fossils is done in the most harmful manner the industry can get away with to eliminate as much labor cost as possible. Note that lower costs does not mean lower prices because high profits are something everyone seeks aggressively in the fossil fuel burning industry. And high profits limits the efficiency of the economy and results in under investment – investment in production cuts profits – and under employment. Again, I’m not certain I see the point of the book. He seems to make a compelling case that fossil fuels are an absolute necessity to civilization. Fair enough. Doesn’t that mean that if severe AGW turns out to be a reality, he’s celebrating the fact that the *only* means of preserving civilization is to eradicate most of humanity? Not to mention that when fossil fuels do effectively run out, whether it be a century or two from now, he’s making a compelling case that’s the end of civilization. I think he might well be correct, but this seems a downer of a book. We are absolutely trapped on the train of increasing fossil fuel usage, and if there’s a track break ahead, or inevitably when we reach the end of the line, we all die. Let’s start a Facebook page to celebrate it! @Mike Sproul-The trouble, or one of the troubles with hydro is it is very land intensive. You have to permanently flood a lot of land to create that higher up lake. That’s land that could have been put to some other use. Sure, some usage can be reclaimed by recreation and perhaps fishing, but there is no guarantee that people will get more value out of that and the energy provided by the dam, as they might have gotten out of putting that land to some other use. Which would be one thing, if the owners of the land agreed to the deal-it would mean they at least expected to gain from it-but quite another if a dam is a government public works project, as has often been the case. And in this particular case, you’re talking about using the lake as a giant battery, rather than a source of mechanical energy for a generator. One might as well just use hydroelectric power at that point. What about nuclear as an alternative? Absent regulatory barriers, electricity would be too cheap to even meter. (Maybe there’d be some low fixed cost fossil fuel generators at the top of the power stack). As early as 1958 nuclear powered cars were already on the drawing board. With the possible exception of air travel, transport could also be completely nuclear. There’s no market barriers, simply society collectively decided to ignore a gigantic free lunch. Huge tank sunk to ocean floor. Pump water out when excess energy is being produced with flow back in through the turbines when energy is required. Drawback is that huge tank is an understatement. @Michael The goal should not be to create jobs, but rather productive members of civilization. Everybody dig holes and refill creates jobs but no production so everyone starves to death in the literal sense. Welfare may be cheaper than keeping people employed in make work. In construction we get paid by the square foot, not the sweat gallon. There is no serious evidence that global warming is remotely likely to “wipe out most of humanity.” Thats surely not what the IPCC reports actually say for example. You are correct that pumped hydro storage is a method of storing power. However losses are 30-50% so you only get at best around 70% of the power back that you put in. Also Hydro is not very expandable, most of the sites have already been utilized. I think the above is a bit of hyperbole. It has helped but I think less than people think. Infact I think that they only reason we use so much energy is because it is so cheap. At higher prices we get more even efficent. All of this though I am pro fossil fuel use. Castaic and Pyramid lakes are used for irrigation, boating, and electricity storage (like a battery, not like a hydro generator). I haven’t looked up numbers on whether, as a whole, the system’s benefits exceed its costs. As I recall, there were no environmentalists involved in its planning, so that gives me reason to think it might have been a good deal economically. Good points. It’s only useful if the electricity would have otherwise gone to waste. Even the IPCC’s RCP 8.5 scenario (which contains an implausibly large amount of coal usage) does not result in warming that “eradicates” any significant portion of humanity, let alone “most” of humanity. I don’t think it hurts your general case, but the “decades of favoritism” thing is almost certainly completely false. I doubt that the entirety of “alternative energy” subsidies throughout history, all placed in a pile of cash, would be visible next to a similar cash pile representing the amount spent on fossil fuel subsidies in the form of foreign military adventures. And you think any of this technology would be worked upon if there weren’t environmentalists claiming fossil fuel use is evil? Culture beats economics (almost) every time. If fossil fuels are “good” (as opposed to necessary, which everyone’s actions acknowledge), there’s no cultural push to invest in alternatives. In fact, given the way humans work, if fossil fuels are “good”, then alternatives are “bad” and should be suppressed. And without compelling *immediate* economic arguments to look at alternatives, we’d see *less* research than would be optimal for the long term. Fossil fuel use *does* have compelling immediate economic benefits, so it doesn’t really need the cultural sell. This is a good point, but it could also run the other way in the following sense. The U.S. has provided the bulk of military support for joint ventures, including during the cold war, for Western Europe. Could that not be seen as freeing up some of their budgets for use in subsidizing alternative energy? I have heard a similar argument vis-a-vis health care expenditure, and I think we could apply it hear. If you insist in limiting your thinking to fossil fuels v returning to pre-industrialization levels of income and populations then fine, lets congratulate ourselves for having used fossil fuels. But as economists, shouldn’t we be thinking about the marginal costs and benefits of oxidizing fossil fuels v other ways of generating energy, especially nuclear? But I agree that it’s crazy to talk about fossil fuels as being good. As Amory Lovins correctly points out, cold beer is good. That should be the goal. “People don’t want raw kilowatt-hours or lumps of coal or barrels of sticky black goo,” Lovins says. “They want hot showers, cold beer, comfort, mobility, illumination. It’s like when you go to the hardware store looking for a drill. What you really want is not a drill but a hole. And why do you want the hole?” Asking such questions, Lovins says, is the first step in good design. -No, we’re not. Look at developed Europe and the United States. and if there’s a track break ahead, or inevitably when we reach the end of the line, we all die. Something called “the price system” exists. You’re thinking like a socialist. Stop it. Most of the world ain’t Venezuela. -So the rich simply sit on their money and occasionally smoke it. Profits are never re-invested anywhere, and the greedy oil execs never desire any extra return on them from outside their own industries. This is why countries with state oil companies like Venezuela, Russia, and Saudi Arabia each produce much more oil than the capitalist United States ever could, despite the fact they all have much smaller oil reserves. Got it. You think the energy demand curve is fixed? E. Harding – Something called “the price system” exists. For crying out loud, we all understand that. But all that means is that we won’t all run out at once. It simply becomes less and less obtainable. In the end, the effect is the same. If the book is right, and fossil fuels are a *necessary* component for civilization, then we are cooked. Now of course, you may feel that the book is wrong, and that fossil fuels aren’t necessary and we can find better, less dangerous ways. But I was pointing out if the book is correct, it’s nothing to celebrate. So…natural resources have not become more accessible over the centuries? The price system doesn’t mean people “run out” of things. It means that people get signals to better know how to obtain those things they want. S&D curves can shift left OR right. Most raw inputs to our economy are not in danger of running out. Silicon is extremely abundant. Most other metals can, worst case, be recovered from landfills if we ever exhaust the original mines. Water may require filtering/desalination to be useful to us, but we’re nowhere close to a shortage of the raw substance. Etc. Fossil fuels are a terrifying exception to this pattern. There is only so much in the ground, total, and once the stock has been mostly extracted we could plausibly NEVER recover if we have not moved on to other energy sources. Think Easter Island, but on a planetary scale. Under the status quo, we should have at least a century to wean ourselves off of fossil fuels, which will hopefully be enough. But a radical policy change which shortens that runway without accelerating solar and nuclear R&D by a comparable amount could be the most catastrophic event in history. Christopher pretty much said everything I wanted to say. Celebrating fossil fuels, which I do believe are pretty much a necessity for civilization, seems only likely to make us less likely to try and find alternatives, increasing the risk that we “run out of runway”, as Christopher so eloquently put it. I don’t think so. Even if fossil fuels are the very best source we can imagine, there are still plenty of reasons to develop and support alternative energy sources, even without environmental arguments. In general, we should look to have a diversified energy portfolio as a hedge against downside risks and volatility. In addition, even if fossil fuels are the best overall source on average, there are likely plenty of specific cases where an alternative source is better. Without a diverse energy market, it is hard to optimize the energy sector. Ultimately, environmentalists have reasonable concerns and can play a positive role in the development of alternative energy, but the role is likely to be minor. Alternative energy sources will develop with or without them, even if fossil fuels remain dominant. If we banned coal, that would force us to have rational nuclear regulation to let it fill the gap. We’d save money and the environment. Fossil fuels either are or aren’t the best current technology, when we take all risks and benefits into account. But if we agree that they’re the best current technology, it makes no sense to vilify them because we’re worried we don’t presently have something even better. Why do you call these fossil fuels? The notion that all hydrocarbons coming from the depths started as surface life forms in the distant past is a theory. Of course it has some support and some parts of it are true (yes, peat bogs can become coal seams). But whether that explains all coal and petroleum sources is asserted without specific proof in most cases. Hydrocarbons are found throughout the solar system not all are associated with life forms so far as we know. I submit that this high-repetition meme is a bit of environmentalist propaganda, because it begs the question of the size of earth’s energy reserves. Brian – I don’t think so. Even if fossil fuels are the very best source we can imagine, there are still plenty of reasons to develop and support alternative energy sources, even without environmental arguments. In general, we should look to have a diversified energy portfolio as a hedge against downside risks and volatility. How logical. Unfortunately, in terms of decision making in both corporate and government contexts, logic is usually about 2-3 on the list of importance. Sure if logic *screams* that something is harmful, it can override lots culture (much of the time), but only rarely does logic make such a convincing case. Usually it’s only used as a bolstering measure for decisions based on other factors. We are not rational creatures, we are rationalizing creatures. Thus I look at how one would influence the culture towards making decisions I approve of (which are, of course, completely rational :-)). Chad – Actually, I think if we look at your arguments, I’d give you PCs (no real good or bad there), and I’d quite agree that what is considered “good” about the automobile or conventional medicine has mostly certainly precluded optimal funding of alternatives. Travel abroad has led me to question my dismissal of everything we don’t consider “good”. I’ve begun to realize we dismiss an awful lot that I would consider, if not evil, pretty dodgy, yet significant parts of the rest of the world use for good effect. Actually, I’ll take back PCs. If people hadn’t characterized Microsoft as “evil”, I don’t think that Apple or Linux would ever have received the interest or funding that allowed them to exist. Without this arbitrary philosophical pigeon-holing, I think the technological revolution would be way behind its current status. The culture does not make heroes of oil workers or oil investors. I think they should be viewed as heroes, and I’m hopeful that Mr. Epstein’s book helps that happen. All you have to do to make the case that fossil fuels have been a great blessing to humankind is think what the world was like in 1900, before the invention of gasoline powered automobiles. All the world’s great cities smelled of horse manure. Now there was a pollution problem, no? Or think of the nonpolluting nature of sailing ships. Then think of the perilous and unpredictable nature of crossing an ocean on a sailing ship. Wouldn’t you rather do it in an airplane? These environmentalists who insist that fossil fuel producers are akin to tobacco companies are morally deranged. Smoking kills people and the consumption of fossil fuels brings abundant happiness to everyone fortunate enough to live in a country where their use is widespread. Any man who says that we are addicted to fossil fuels should be forced to summarily go cold turkey for one month on his fossil fuel addiction. Many of these newly virtuous Adams would literally die. So come on, already.